On the market for the first time in at least 60 years, and in some cases for more than a century, a small collection of 17th and 18th century silver accounted for a fraction of the lots but 20% of the total at the two-day winter sale at Canterbury Auction Galleries (24% buyer’s premium). It had been put together by a wealthy Derbyshire gentleman who, when not serving with the lancers in the Boer War or publishing his memoirs Travel & Sport in Turkestan in 1910, exercised his shrewd eye in the London salerooms and dealers’ shops. After his death the collection of John Price Wood (1877-1962) passed to his heir and last year it was inherited by the third generation. Auctioneer Tony Pratt knew of its existence, having made an insurance valuation some years ago, but the prize piece among the 14 lots was a bonus. He had seen a fine cast sauceboat by Matthew Walker, Dublin 1726 but a 1962 probate list alerted him to the possibility it was one of a pair. 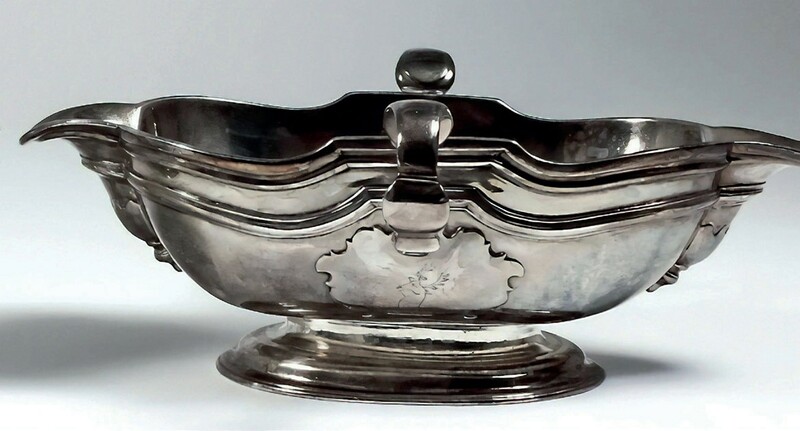 A search ensued, family members were contacted and finally the housekeeper found the second sauceboat, a bit tarnished but otherwise fine, in the back of a kitchen cupboard. At the November 27-28 sale, the 9in (23cm) wide boats, with cut-card armorial panels and engraved with stag’s head crests were estimated at £3000-5000. An Irish mark, Huguenot styling and condition were in their favour. Bidding took off among dealers and collectors before the pair sold to the London trade at £57,000. Another early Irish item was also a surprise. This was the snuffers and original stand which Wood had bought at Christie’s in 1897. Assayed in Dublin in 1708, they were marked JP beneath a skull and crossbones, thought to be for John Palet, John Pattinson or John Pennyfather. The £2000-3000 estimate was swiftly eclipsed by the London dealers who dominated the bidding and the lot sold at £18,500. Wood’s connoisseurship impressed Pratt, who pointed to the general crispness of the pieces – exemplified by a Charles II circular tazza and two 17th century tumbler cups. The 14¾in (37cm) diameter tazza opened the sale, in line with Pratt’s usual policy of starting proceedings on a high note to get the day buzzing. Thought to be by John Sutton, London 1678, the 36oz tazza, embossed and chased with leaf scroll ornaments and engraved to the centre with a pseudo-crest went a shade above estimate at £12,500. One of the tumbler cups was a 2¾in (7cm) tall piece made in London, 1684, and marked JC. 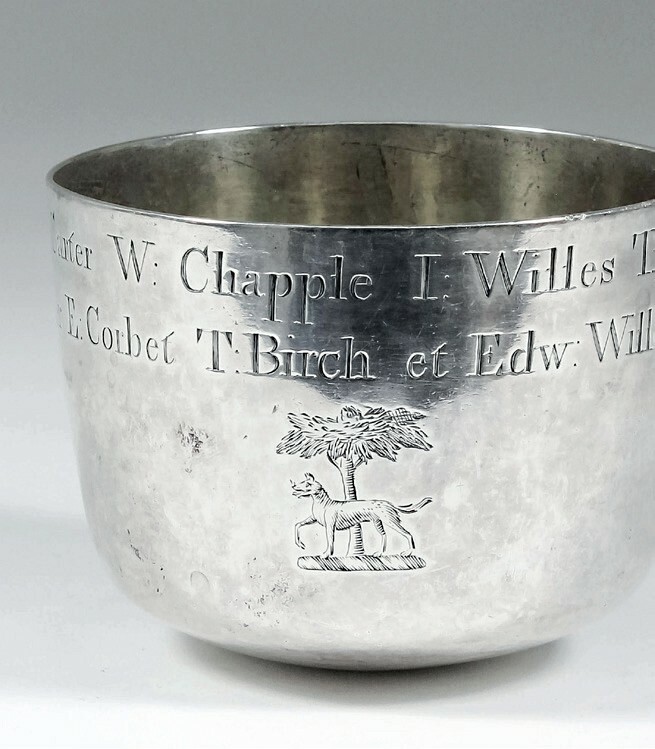 It was crisply engraved with a crested and a contemporary Latin presentation inscription listing the name of the donor, T Abney, and the names of those he wished to remember. Estimated at £1200-1500, it made £5200. Larger at 6½in (16.5cm) high and slightly later, a two-handled porringer by IM London 1687, was engraved with a contemporary coat of arms and initials B*IE, boldly embossed chased with leaf ornament. And cast with a leaf and melon finial to the domed cover. It sold at a mid-estimate £5400. A late 18th century Dutch table snuff box had particular resonance for two bidders at Canterbury. The 5¼in (13cm) long rectangular box celebrated the small but bloody Battle of Dogger Bank fought in August 1781 between the Royal Navy and Dutch squadrons escorting merchantmen during the American War of Independence. Both sides could claim victory – the Dutch never attempted to break the blockade again under their own flag – and the 8oz box appeared the work of an opportunistic Dutch silversmith. It was engraved to the lid with a fleet at anchor and to the base with two ships in action along with the words Geregt Van Capt Oorthuis by Cadiz 30th May 81. Presumably a few weeks later it was further engraved to the side Leeslag Vanden 5 Aug 1781 when the box was presented to the Dutch Vice Admiral Johan Zoutman. The box was estimated at £500-700 but a keen Continental bidder was up against a local collector who already owned a freedom casket made for the leader of the British squadron, Admiral Hyde Parker. Victory went to this collector at £7800. The 14 Wood collection pieces contributed £112,560 to the 1147-lot sale’s £528,000 total. 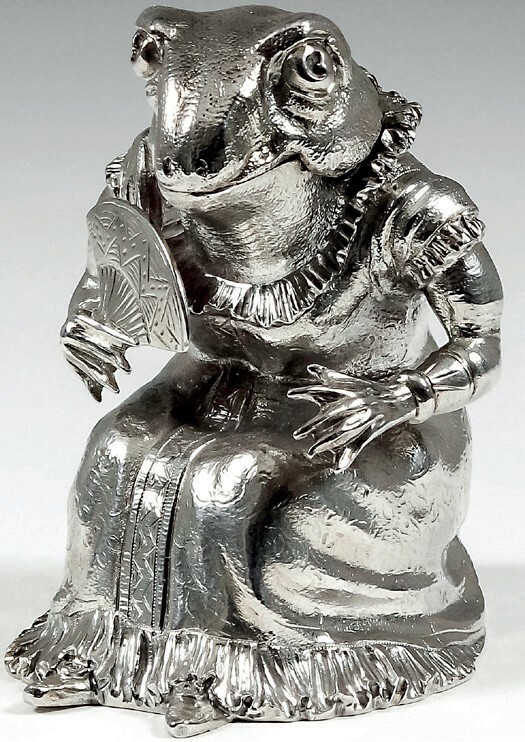 Best of the Canterbury silver from other vendors was a rare Victorian mustard pot modelled as a 3in (7.5cm) seated frog wearing a full-length dress and holding a fan. It bore marks for James Barclay Hennell (London 1881), maker of some of the best Victorian novelty condiments including the famous Punch and Toby pots. The well-dressed amphibian was pitched at £1500-2000 but attracted interest from as far away as Australia before going to a UK buyer at £7200. A private collection of 123 pieces of silver by Georg Jensen (1866-1935) was the major draw at Dreweatts’ (25% buyer’s premium) November 28 sale in Donnington Priory. All but four got away, contributing £588,000 to the £1.09m total at the 472-lot jewellery, silver, watches and vertu sale. The Danish designer has never been out of fashion but demand today is greater than ever. Some collectors insist on pieces made in his lifetime but there is also a huge market in much later work, as evidenced at Dreweatts where everything bore post-1945 stamps. All the top sales went to UK dealers and private buyers, with a few going to Continental bidders. Top-seller was a Blossom pattern, Design No 84, table service designed by Jensen in 1919. It comprised 307 pieces of silver cutlery weighing 592oz plus 117 various steel knives and forks with silver handles, and against a £20,000- 30,000 estimate, sold at £85,000. 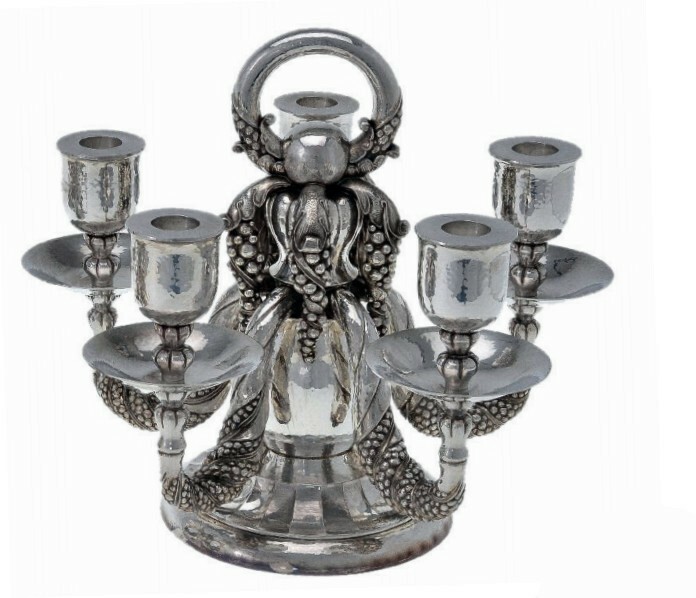 Two pairs of Jensen’s c.1920 five-light candelabra in the Grapes pattern, Design No 383, took £17,000 each (estimate £10,000-15,000). Johan Rohde (1856-1936) designed for the firm from 1906, and exclusively so after 1913. While Jensen, with an eye on the market, remained heavily influenced by Art Nouveau, Rohde was pushing ahead with what became known as Art Deco. In price terms, Jensen and Rohde designs are rated as equals. Rohde’s name was applied to 23 of the Berkshire lots. Among them was a 2ft 6in (76cm) oval fish dish, drainer and cover, Design No 335c, created by Rohde in 1919. Estimated at £20,000-30,000, it sold at £45,000. 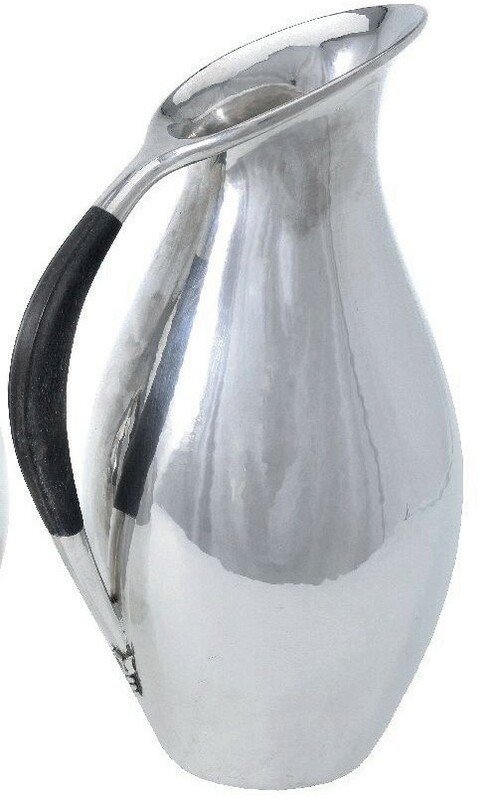 Jensen considered Rohde’s design for a water pitcher, Design No 432, too advanced for clients’ tastes and did not put it into production until 1925. Two pairs of the 9in (23cm) tall, ebony-handled pitcher sold within estimate at £2800 and £2400.